Arran 14 Years-Old is a radiant whisky from the unique distillery on the Arran island in Scotland. This Single Malt Arran 14 Years-Old comes from a mix of Bourbon and sherry casks of first and second filling, this Single Malt 14 Year-Old Arran got richer with numerous aromas during its aging to obtain shallowness benefits, with spicy fruit caramel notes, chocolat and toffee. 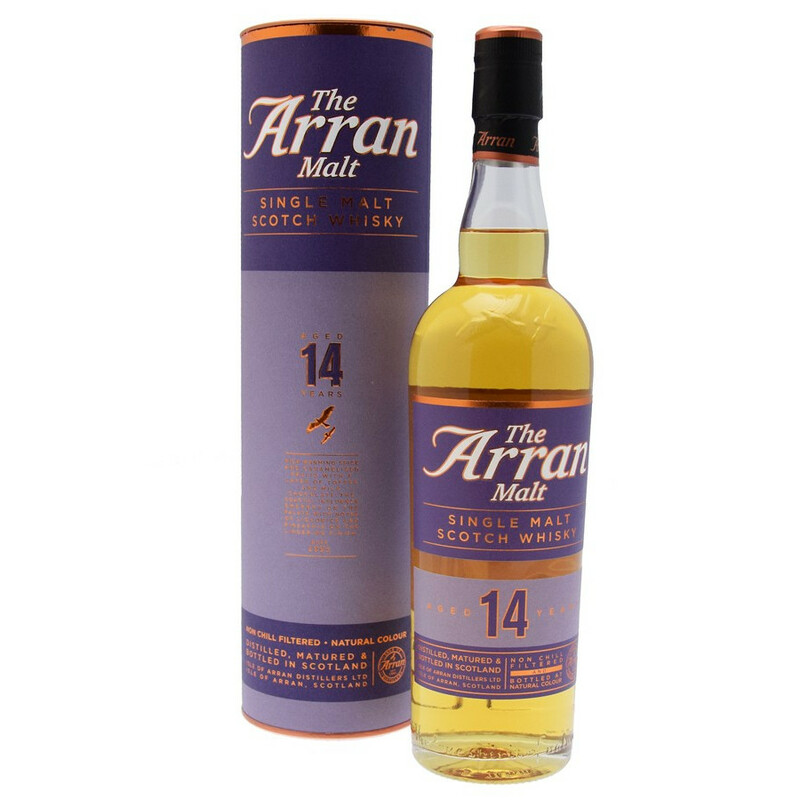 Proudly independant and environment-friendly, Arran 14 Years-Old is just like all the distellery's range, unchillfiltered and non peated. Arran is the only distillery located on the Isle of Arran, Scotland. It has been established in 1995 in Lochranza. Arran has been a part of the world of whisky for a long time. In the mid 18th century, the island had nearly fifty distilleries (most of them illegal or “moonlight” distilleries), but they all have closed since then. The new distillery opened in 1995 and renewed the tradition of Arran. The spirit produced on Arran received the “whisky” label in 1998. Nose: very present, it has woody vanilla aromas with fruitly notes ( white grape, ripe peach), medicinal and herbal with the existence of eucalyptus fragrance and pine resin. Palate: it embodies a lot of very gourmet notes, frangipane pastry, meringue lemon scale. Little watery notes articulates then exotiques fruits like papaya and cantaloupe. Finish: perfect balance between nose and palate, it continues with ripe fruits (white peach and apricot), spices (nutmeg) and camphor.